Perusing the plentiful materials included here and the mass of performers involved, one can easily see that this recording can be considered more of an event than a recording. That is, there may be parts of it that listeners won't like, but the whole thing has a grand aura about it, almost a sense of history. 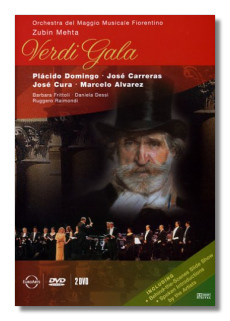 Well, it should: the concert was held to commemorate the one-hundredth anniversary of Verdi's death by way of presenting fairly generous chunks of the composer's operas – amounting to just over two-and-a-half hours of total music – from the various periods of Verdi's career. The production moves from the early operas, beginning with Nabucco (the famous Va, pensiero chorus), Jerusalem (really the 'French' I Lombardi), Il Corsaro, and moving onto the popular middle-period operas – Rigoletto, Il Trovatore, La traviata, and Un Ballo in maschera – and then, after La Forza del destino and Don Carlo, closing with Aïda, Ottello and Falstaff. Actually the Nabucco chorus is reprised at the end. There are no disasters, or even disappointments, in any of the numbers, most of the singers acquitting themselves quite well. Who is most impressive among them? Probably Domingo and Dessì in the longest segment here, the closing scene from Otello. Clocking in at twenty-two minutes, this track is nearly as good a representation of the music as pure opera as you are likely to encounter in a live or recorded performance of Otello. Domingo knows the role well, having recorded it with Levine for RCA twenty-five or so years ago and again (also in 2001) with Muti. But Dessì, sometimes a slightly cold artist, is impressive here too. She also turns in a fine 'Pace, Pace, o mio Dio', from La forza. I should mention that Domingo also sings Manrico in a couple of ensemble numbers, where, again, he is quite fine. Carreras, who has been in decline over recent years, turns in fine work, too, especially in the three numbers from Jersalem and Il Corsaro, which are heard consecutively. Barbara Frittoli, too, is excellent in her Ritorna vincitor! from Aïda. Zubin Mehta leads the proceedings with a knowing hand and the orchestra plays well. The one feature about the production that some may find bothersome are the spoken introductions that come before each individual opera's excerpts. There are about twenty minutes devoted to this aspect on the two discs, though, admittedly, some of these tidbits are informative, some even humorous – try Domingo and company's introduction to La forza del destino. The sound is excellent and the EuroArts production first class. Recommended.